I'm a journalist and former Enterprise resident who wrote many an article about the Boll Weevil Monument. I think it's awesome. Here's a cool old pic I stumbled across of what the monument looked like back in 1919 when it was dedicated. 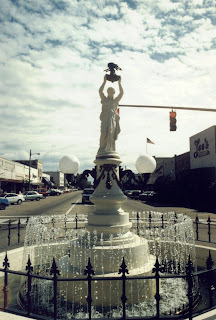 I'm really glad they capped off that randomly spewing fountain with the iconic boll weevil in 1949. Water just doesn't have the same fascination somehow. The Boll Weevil Monument isn't Enterprise's sole claim to fame. On a smaller scale (small being the operative word), the city hosts the world's smallest St. Patrick's Day Parade every year. It consists of one person, decked out in green and waving an Irish flag. Kathy Sauer started the event in 1993 when she was president of the Enterprise Chamber of Commerce. It's a bit o' fun and a bit o' free publicity for the city, and the overhead is low as you can get, so the tradition continues. Rock on, party people! A security camera, a Weevil Cam if you will, has watched over the Boll Weevil Monument ever since vandals underestimated how tightly the bug was attached and wrecked the original statue in 1998. For years this camera has been mounted right outside the DJ's window on the WKMX Radio building overlooking the monument on the corner of North Main Street. KMX relocated awhile back, but I couldn't remember what the new sign read when we drove past on our visit to town last year. Thanks to Anne in Enterprise, I know that WVVL 101 FM Country now broadcasts from the building (WVVL = Weevil, get it?). If you go to this WVVL 101 page, you can just make out the camera at the top of the picture on the building's corner. I have no idea if anyone actually records or monitors anything, but maybe just the presence of a camera keeps people from pouring soap in the fountain. All of which reminds of me of the good ol' days with KMX. I was sad to hear it had moved, as that radio station was a fixture in downtown Enterprise for many years. In my early teens, it was *the* station to listen to, the one playing songs I'd seen videos of on Night Flight or Radio 1990. I'd go in from time to time for a CD I'd won or a free bumper sticker (this was back before I even had a car or license, but it was just fun to go into the radio station). For a few years I'd tune in to the four-hour Casey Kasem's American Top 40 broadcast every Sunday, too. You couldn't pay me to listen to 5 minutes of something like that these days, but as a kid in the '80s I loved it. The main thing I remember about KMX, though, is the interior looked like a spaceship bachelor pad for aliens from the '60s. This was in the 1990s and early 2000s (I can't begin to remember what it looked like in the '80s, maybe it already looked like a set from Barbarella even then). It was like the old movie version of the future, where everything was shiny and modern in a futuristic, hip way. Only I think what you saw when you walked into KMX was fairly recently put in, not some out-dated design they'd done decades earlier. Let me set the scene: You'd walk in off the street to see walls of a shiny, textured silver material. It kind of looked like crumpled tin foil, if memory serves. The ceilings were entirely mirrors. There was a spiral staircase winding tantalizingly upwards to where the magic happened -- the DJ's booth (I used to think it would be cool to be a DJ when I was a teen, before I found out about the crappy hours and pay, and that you can't play whatever you want). The carpeting, though, is what really completed the whole tone of "Yeah, baby!" -- it was burnt orange. Possibly shag. I think it was supposed to be cool, hip and rock 'n' roll. The only thing it lacked was a bowl by the door where men could toss their keys to get the party swinging. Remember the Two Wild & Crazy Guys sketches by Dan Akroyd and Steve Martin on SNL in the '70s? They would've immediately moved into the KMX office and invited over some foxes. Whatever else it was, the decor was interesting. It was unexpected. It was memorable. That's much better than boring, surely? But I don't think it fits in with a country station. I wonder if they've redecorated? If anyone knows, please share! Birth of a Monument: When and how an unusual monument took center stage in Enterprise, Alabama. Vandalism & Rebirth: It's been knocked down, but it got up again -- a look at the damage and ultimate destruction of the monument caused by vandals. Never fear -- a replica came to the rescue! Weevil Woes: The tale of how boll weevils came to Coffee County and took a bite out of the economy. The Daily Show: The Comedy Central program visited Enterprise to report on the missing weevil. Hilarity ensued (or calamity, depending on your outlook). The Boll Weevil Monument in Enterprise, Alabama, made international headlines when vandals stole the bug and damaged the statue in 1998, inspiring a segment on The Daily Show. A replica stands in the monument's old spot on Main Street, and the shattered original is in Enterprise's Depot Museum.